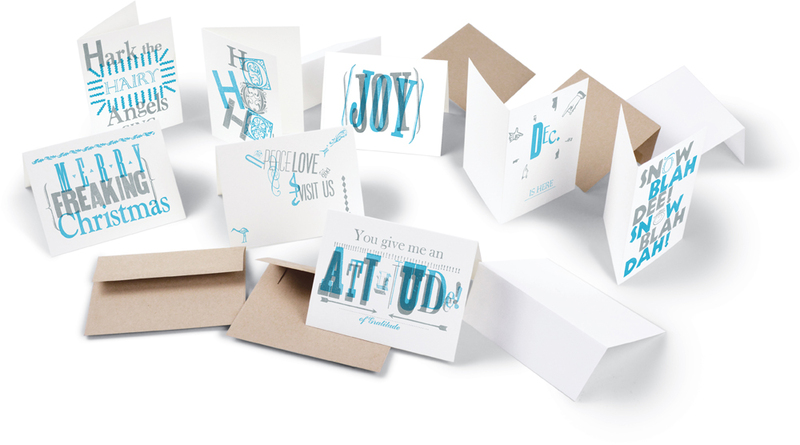 A few of our Christmas / New Years + a couple of Valentines cards done in our Holiday Card creative letterpress workshop. 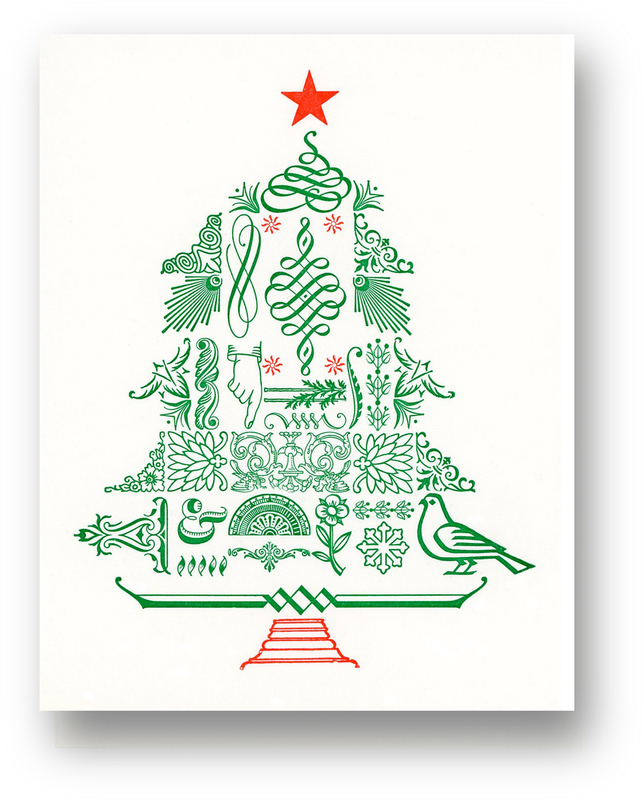 MAKE YOUR HOLIDAY CARDS stand out in the crowd by designing and printing them yourself, via letterpress of course. You have access to anything in Lead Graffiti's large collection of type, dingbats, borders and themed wooden images. 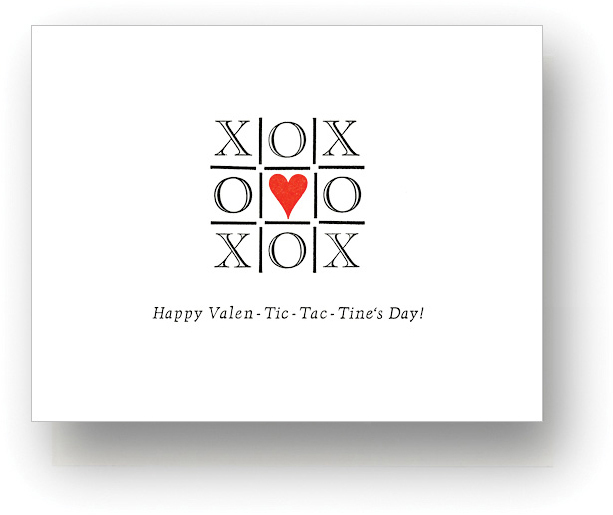 Whether you go classic or opt for clever, sending these cards will be a memorable experience for you and a keepsake for everyone on your mailing list. For everyone of us who has said they'd like to quit Facebook or Twitter, this gives you the opportunity to make a stand. Sending cards (to young and old) is a nice reminder of how how great it is to get a little surprise in the mail. Checking email doesn't quite have the rush of opening an envelope does it? Make it a party with old friends or join a group to make new ones and focus on a special holiday. 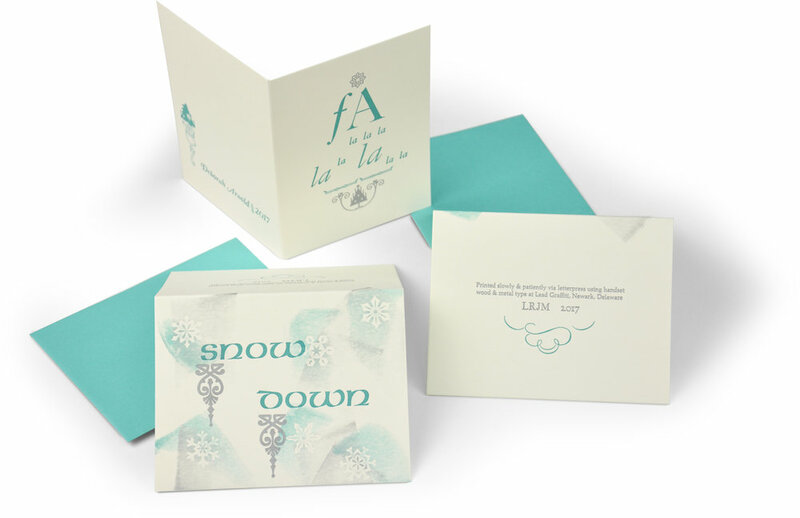 Print 30 cards (envelopes included) in up to 2 colors, blank inside. Everything is pre-cut and scored for folding so you can take them with you before the ink is dry. NOTE : There are times we do a variation of this workshop and some details may change. For instance, we might limit the size to a 6" x 4" postcard so we can gang print them (maybe as many as 8 at a time). We might include or not the envelope. Often we might limit the number of colors we are printing. Whether it's Christmas / New Years, Valentines Day, Cinco de Mayo, Thank you, or maybe Declaration of Acceptance cards, we're happy to help your group celebrate with a batch-of-cards-workshop on request. We almost always schedule these workshop because we want to make them for ourselves. Typically, around the first of the year we do a version of this workshop where we print a postcard declaring our intention to accomplish something important. The idea is to mail them to people that care that you follow through on such things. As it is embarrassing to not follow through, you have a bit of extra incentive. You can see a blog entry for our effort in January 2018 here. Below are some samples to get your creative holiday wheels spinning. For clubs and similar groups we offer a postcard option that is gang printed (multiple cards printed on a single sheet at one time). ⬆ Blue and silver coordinated this group's holiday cards. ⬆ The heart always wins this game. ⬆ Sometimes the simplest message is the most heartfelt. ⬆ This tannenbaum has lots of tchotchkes. ⬆Ray’s “Declaration of Acceptance” card in January 2018. 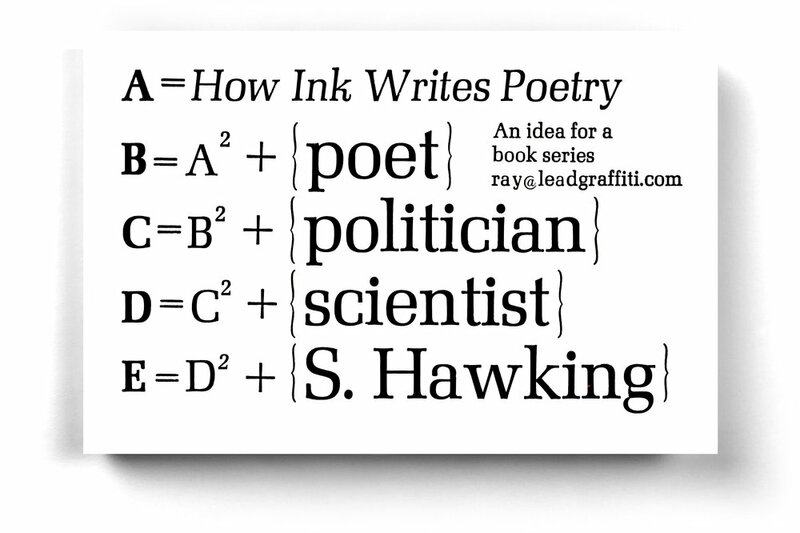 Unfortunately, the idea was to get Stephen Hawking to write one of our books and he passed away 4 days after we printed it. We still need to go at those 3 steps leading up to it. We have an agreement for someone cool (to be announced later) to do that “B” step, so after a bit of a slow start we are back on track.